This app has spontaneously ceased recording in the middle of something important the last 3 times I have used it. If you care about what you are recording I would strongly recommend against using this app. This is a recording of my feelings at the funeral of Sr.Rosalin. Best recorder I’ve ever used reliable and very useful with good quality sound. This app is so useful. Especially since it’s been improved and recordings can be e-mailed directly from the phone. I love it. This recorder is by far the best that you can find on the Apple App Store! It’s simple, easy to use, has quick pause and resume speeds and you’re able to double time your recordings. I have used this app for my medical training for years and it’s by far the best thing that I’ve used! Very easy to use and can be used without internet my favorite! I use it all the time, Keep up the good works....Thanks so much!!! Please don’t ever go away! Love my iRecorder. It captures all my inspiration much the same way my old dictaphone used to due but ten times better. Very Functional for recording ideas in the fly. Also easy to send via email or other ways. Great app!! My iPhone is telling me that the app will not work with later versions. I hope there is an update before that happens. i wasted money on thinking it would show my screen😒 pretty disappointed but i do like the audio. PLEASE READ!!!! 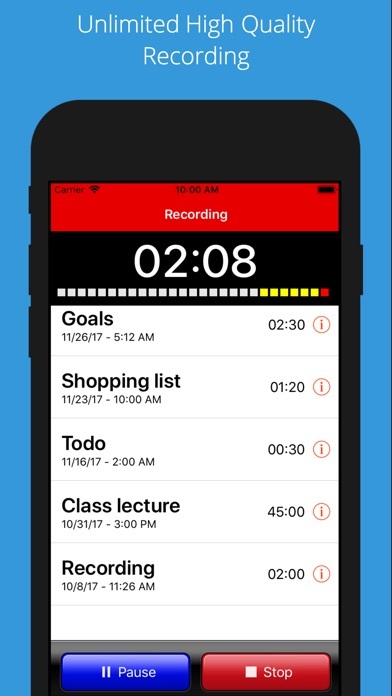 This app does what it says it only records your voice. This game designers are jerks because iMovie cost the same amount of money and if you want but you can do a lot more with iMovie. Why would I only want to record my voice when would that ever come in handy. Also I can't believe you have the nerve to charge $4.99 for this game. Now I'm not a computer genius but the app designers certainly are not this app seems like it would take 15 minutes at the maximum. Even I could code this. I'm tired of always getting scammed for money. This even said pro recorder when your recording so it try's to throw you off I want my money back you gigantic jerks!!!!!!!!!!!!!!! I will never buy another app made by your game company. If you're smart you'll take my word if your dumb you'll download this stupid app!!!!!!!!!!!!!!!!!!!! I have used this app with few problems until the new update was downloaded. My very special recordings, including a lecture I need to write a paper on, was deleted. Now, the entire app has disappeared from my IPhone 6. What a waste! iOS 9 and lack of updates has ruined the app. As of installing iOS 9 the app no longer records for more than a second. There have not been any updates to the software in a few years. This use to be a great recorder prior to the up-grade. Now any recording longer than 10 minutes, forget it, it pops up as "no-name" and there's no voice. Still, when it works, it's great. This App works great. A few comments: would like to see a PAUSE button. I'm a musician so I'm fussy about the recording quality. For everyday use and rehearsals it's great but a few times i tried to record my band and it was distorted even when i put the ipad far away. I then used a stereo condenser mike plugging it into the earphone jack of all places and the quality is improved. So i'm guessing the earphone jack works as an input jack. I would like to know if there is some way to control the input volume going in to the ipad. Otherwise, an extremely useful app. Truly easy to use, and sounds good! Great quality recordings and I love the ease of use- simplicity of the user interface. I love this app. I do on occasion experience an error with recording and the recording is then lost- this is very inconvenient. It worked fine with iOS 6, and now it's crashing when I end recording and I am loosing entire hours worth of lectures. Is there a way to revert back to ios6 because voice memos in ios7 crashes often as well. Would like the ability to trim/edit the recording. Recordings have lots of dead air that needs to be cut out. I recorded a performance I had at a bar- just set my phone on the piano and pressed record. Really impressive sound quality. I was blown away. It just works great and works every time. It is SO easy to use! It is well worth the investment. I recommend this app all the time, without reservation! Buy it, you will not be disappointed. I love all features of this app - user friendly, quality of recording and so on..but for the option available to save the files. I want the files in mp3 for some downstream applications! Quality of recording playback is really good! It's a perfectly adequate simple recording app. Could have some more features, but for quick note taking, it works well. I have recorded several doctor appts for my grandmother to share with other family members. I’ve used this app for at least 2 years and it worked fine. I updated my computer and phone today and I can’t get any of the recordings to play. When I saved them to my desktop, the recording was not the dr. but 50 Cent rapping. I've used this app for years on both iPhone & iPad. Today I had 2 great recording sessions on my iPhone but when I pressed play it jumped up to briefly display the progress bar but then came right back down. Both recordings show 35 minutes & 50 minutes so there is data I would expect. I downloaded the first recording - but it was empty! Great app. However I lost all of my previous recordings during the upgrade. They did warn me to back up but didn't take the time to find out how to back up. Lost some good things. I've recorded so many memories of my baby talking, and I'm thankful for that, but now the App doesn't work anymore. It appears to be recording, but then it won't playback. I just missed a beautiful moment bc I thought it was working. I'll never get that back again. A recorder that doesn't play back recordings! Might well just talk into a rock. Works well. Gets the job done. Easy to use with all the basics I need. Fast, convenient, and it does the job. Doesn't take up a lot of space for files, can record over an hour with no problem. Works great, does everything I need. 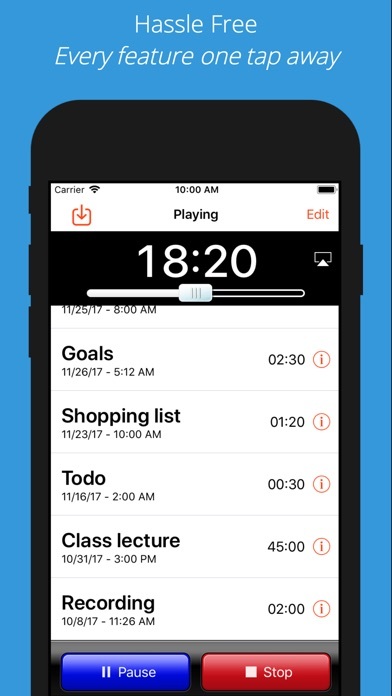 I use this app to record meetings, rather than frantically writing notes. I always get a good recording, share with colleagues, etc. Please note: if you get a call, it will stop recording… Lay your device face up, and keep an eye on it. You will have to restart the recording if you get a call. It was great before, now it's horrible. I no longer have access to previous recordings. It will not open. It opens and closes very quickly. I keep thinking there will be a fix I don't want to lose my info. This app worked great until most recent Apple security update. Does not playback now. I get an error when trying to play audio recording if I have too many and loose all of my files. Does not work with large files ! Twice I got burned with bad files created on important lecture recordings over an hour. 3 times shame on me! Time to find an alternative. I switched to this app after the developer of my other recording app went out of business. A couple of things I noticed. My old app tells me how much space I have used for recordings. I cannot find this information anywhere in this app. Also after stopping a recording there is no way to add to it. Best customer service! Useful and simple tool. Download off phone via wifi is very handy. Anybody working on this?? I don't even know why I give it one star. App used to work great with iOS6. With iOS7 it looks like it is recording and then saves all files with a size of only 56kb (essentially empty). Please fix! 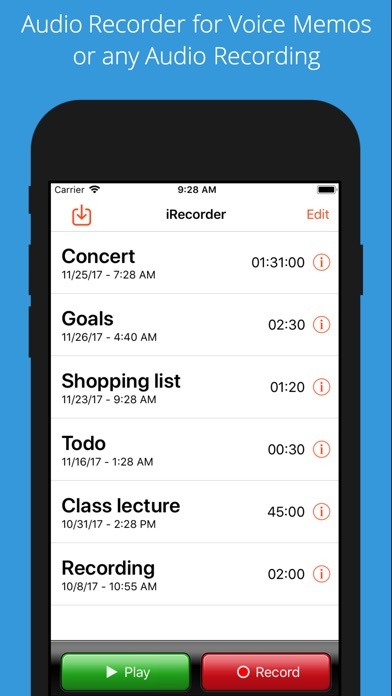 iRecorder works very well for recording my students lessons and masterclass performances. 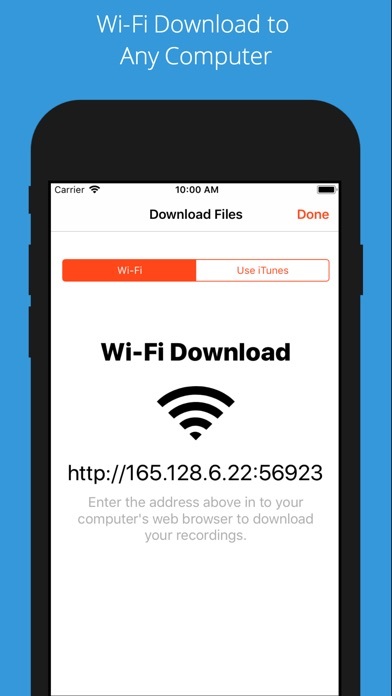 Very easy to email recordings immediately without downloading to the computer. Immediate feedback. Glad I have it. Love this app. As a journalist I use it daily. Excellent layout, ease of use, mic/recording quality even from a distance of 30+ feet. But what it really does need (as others have said in past reviews here) is a short rev/fwd button. My fat little fingers don't do well with the tiny slider, when all I want is to jump back 10-15 seconds. If it's a long recording, one false move and I've jumped back 5+ minutes. So, please add that, and you've got yourself the best possible voice recorder app on the market, bar none. I like to use it when I go to the doctors so I can record his instructions about my meds. I used this app on an iPod Touch at a recent concert since it was a no-bainer to operate. No fussing with settings, bit rates, etc. Just start, stop, and pause. But the resulting mp4 fie wasn’t readable by iTunes or any other program on my Mac—even conversion programs. Be sure to run it for a trial audition first. Wish I’d brought a Tascam or Zoom recorder. I have used this app for the past four years for recording family history. I love the app. I attach a microphone from Apogee and connect it either to my iPhone or iPad, open the app and record away. The app is very easy to use. I can download the recordings to my laptop and import them into iTunes. I keep getting messages from Apple saying that future versions of it won't be supported by IOS. I emailed the company over a week ago. They have not responded. I don't want to see this app go away. I thought this app would record the screen too anyway I could get my money back? Great app, however Apple sends notice that developer most upgrade to meet future iOS. What's up? Recording stopped with incoming call (a call I ignored). Lost half of a 3-hour interview. I’m sick. Absolutely sick. I advise strongly that you avoid this app. 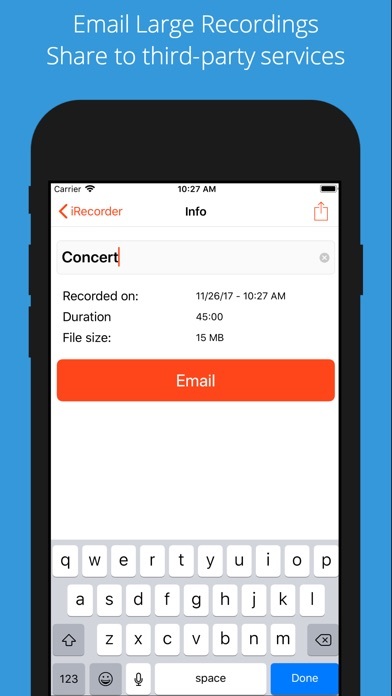 Very user-friendly, you have options to email recordings, and contingent on the memory on your phone you can store a lot of recordings. You can also label your recordings. And thank you for the update for ios support. I was desperately searching for anything as good but there is nothing close. Great recording quality! Exactly what I was looking for. PLEASE... update my old recordings! Hundreds of irreplaceable recordings... GONE!!!!! WHERE ARE MY RECORDINGS!!!!!! Please help!!! So easy to use. So easy to email a recording. To top it off.....terrific sound quality. I recorded conversations with my dad before he passed away. Emailed them to my brothers. Priceless moments saved because of you. Thank you!!! Worth every penny! I wish I have this app on Android as well. 5 years of irreplaceable recordings seemed to be completely lost when iOS 11 appeared. The App is back & it’s better than ever. Way easier backups are Now included. The new version is also downwardly compatible with my older devices which can’t go above iOS 10. All my old stuff no matter what system version I’m running is BACK!! Thanks so much. I’m sure the Touch was not Simple to get this magic done. I had recordings of a relative who passed away earlier this year and I thought they had been lost forever when iOS 11 came out and the app no longer worked. What a wonderful surprise today - thank you for updating. The app works great. Very easy to use. Love I recorder!! It’s great for lectures meetings and excercize classes! I would love to know if I email an hour recording does a copy get saved or do I lose it!